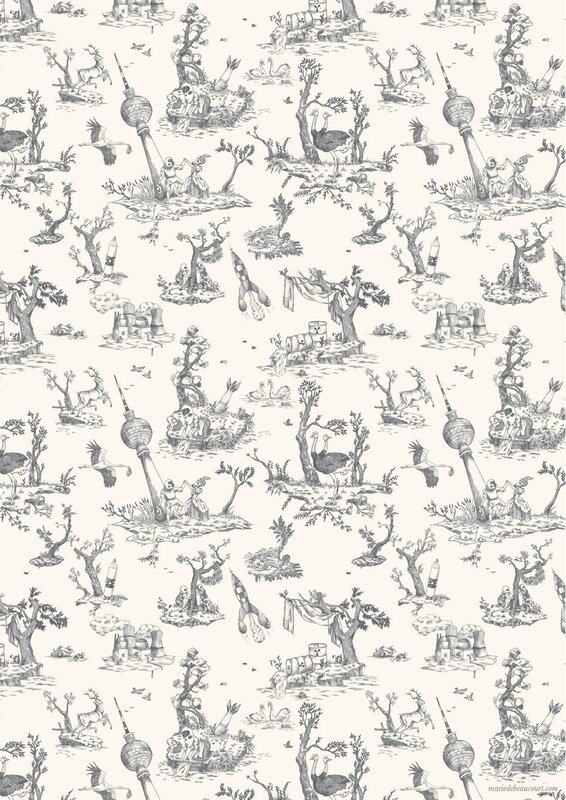 "Toile de Jouy" is a type of decorative pattern consisting of an off-white background on which a repeated pattern depicting a fairly complex scene, generally of a pastoral theme or an arrangement of flowers. The term, Toile de Jouy, originated in France in the late 18th century, when Christophe-Philippe Oberkampf opened his famous manufacture at Jouy-en-Josas. In this dystopian interpretation of the pattern, a lavandière washes her linen in toxic water, children play hide and seek while wearing gaz masks and courtiers dance in a post-apocalyptic landscape. This wallpaper is printed and distributed by duCygne and can also be customised on request.